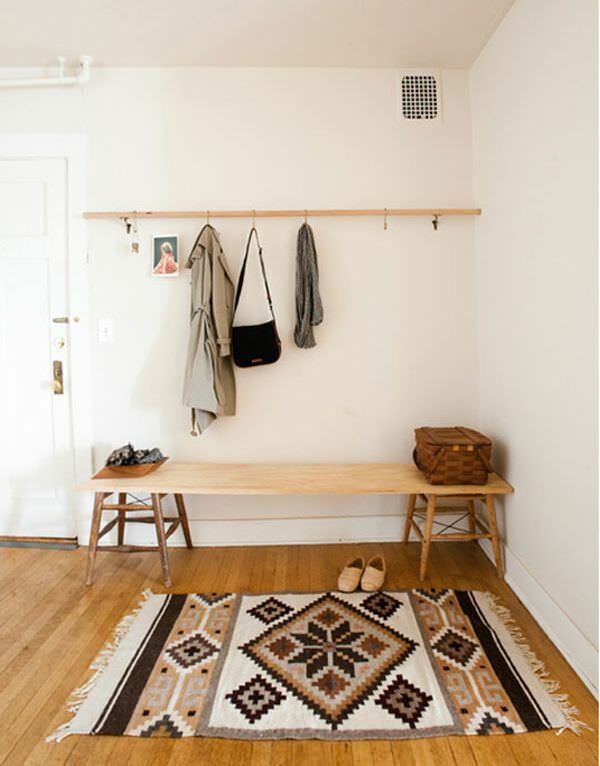 A DIY entryway bench is a really great option when you have a small (or no!) entryway, as is common in most smaller homes. It gives you a space to sit and put on your shoes, or the little ones shoes, and also to set items when coming into the house. It can be pressed into service as temporary seating at the dining table when entertaining, or even used as a sofa or side table in a pinch. Its the perfect height for a kids table when the little ones come to visit. 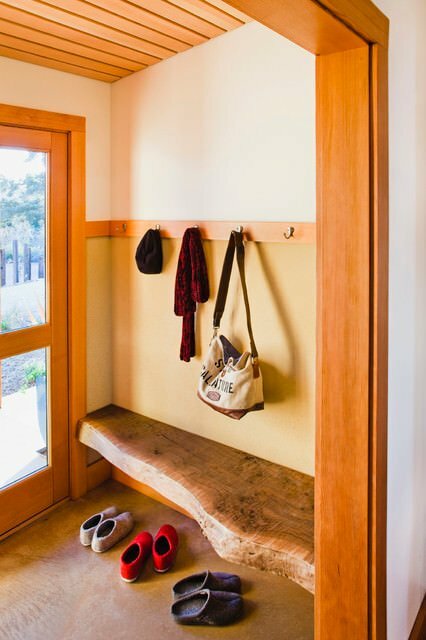 And it helps to create an entryway when there is no formal space at the door, by providing some structure. A piece of furniture this versatile is just what the small house ordered! 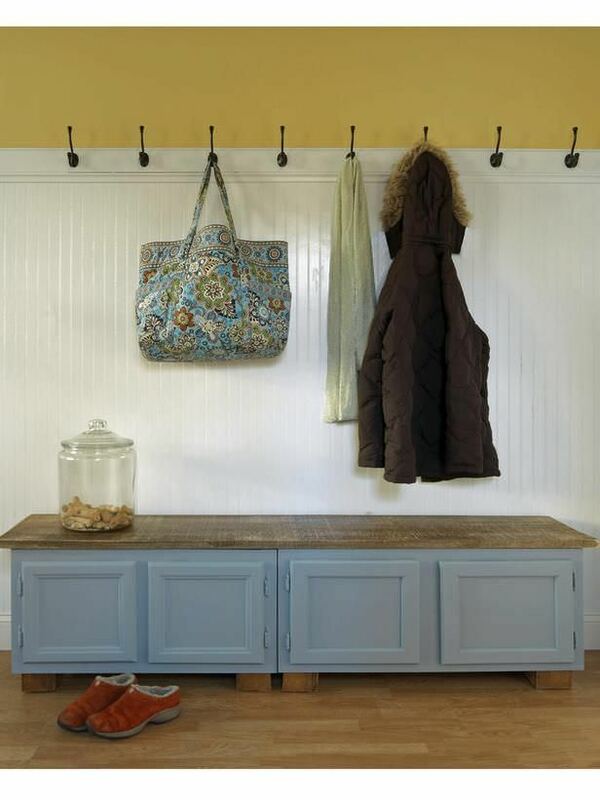 Here are our picks for DIY entryway benches, and we have lots of tutorials here to save you money! Our first project is a great step by step tutorial for a farmhouse DIY entry bench from ‘Home Depot‘. I love that this project takes just basic carpentry skills that anyone can learn. And it’s so pretty! 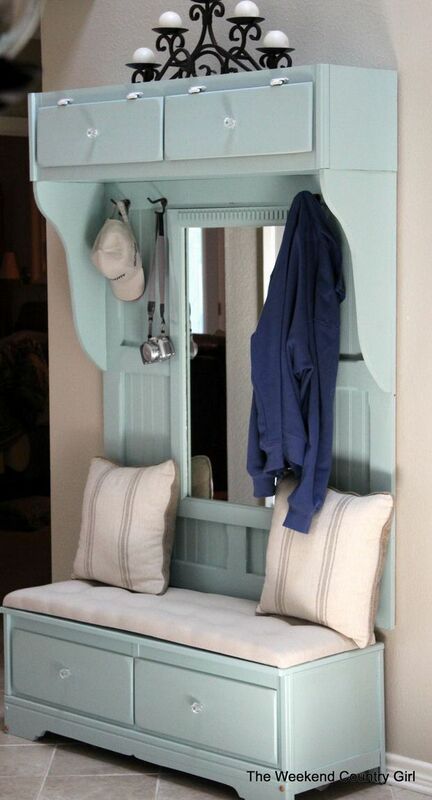 ‘The Weekend Country Girl‘ took an old thrift store dresser, cut it in half, and created this DIY mudroom bench! Oh my this is cool! Be sure to visit and find out how she did it. It might get your creative juices flowing! While we’re at upcycling, see how ‘DIY Network‘ upcycled old upper kitchen cabinets into this easy shoe DIY entryway bench. Great place to find cabinets like these is the Habitat for Humanity ReStore in your area. 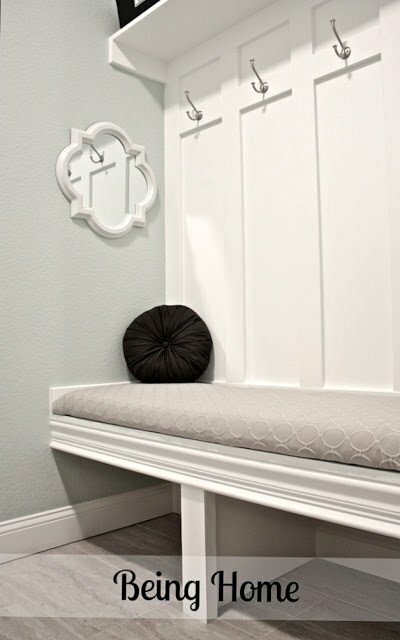 ‘Being Home‘ has a complete tutorial in building a mudroom bench, and another one on the cushion! I really love the built in look of this project. Amazing job, this could really add value to your home as well. 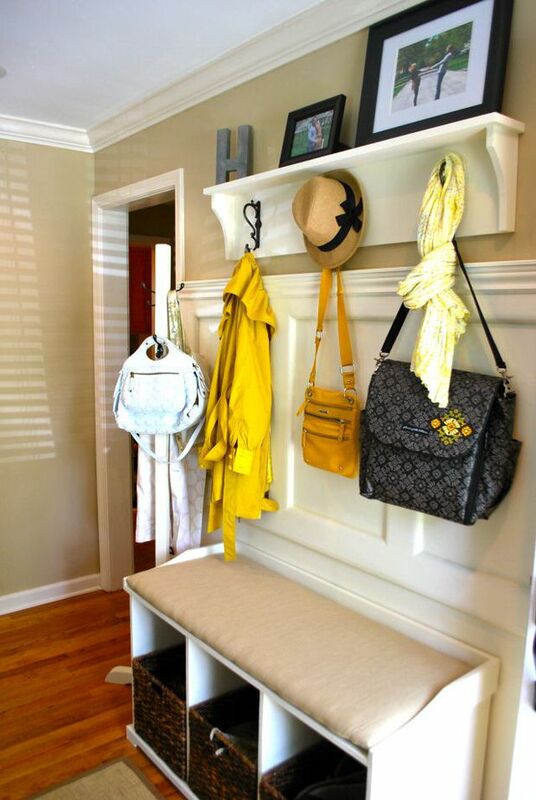 ‘Not Just a Housewife‘ built this simple DIY entryway bench, and shows us just how she did it. I love how her photos make it seems really easy, she really breaks down the steps for you and gives you a lot of little tips. I think this could be a great project for beginner woodworkers! 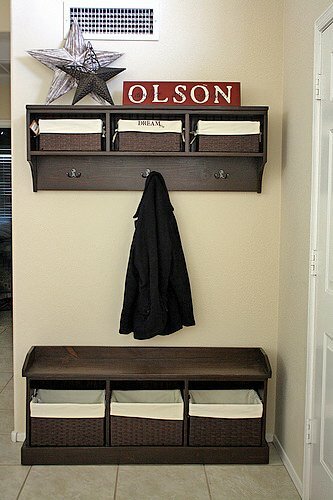 This Pottery Barn inspired entryway bench/ storage unit was created by ‘The Suburban Urbanist‘. This was shared over three posts to get all their storage projects in, but we are linking specifically to the bench post. You can click through while you are there to see how they did the coat rack and other projects! 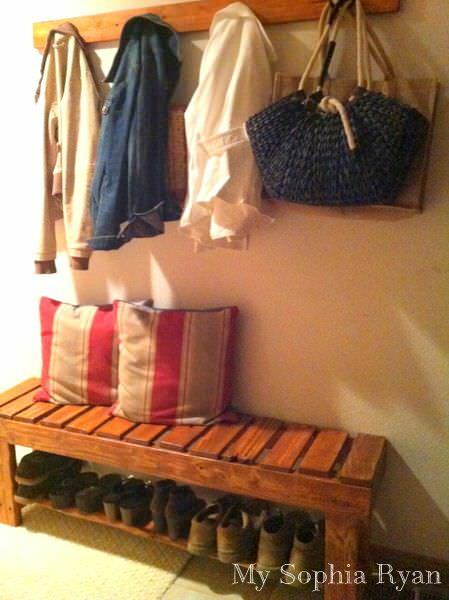 From ‘Ana White‘, this DIY entryway bench and shelf are indicative of all her free plans… amazing! (They need to some up with better words for amazing!) I love how all her tutorials are so detailed…material lists and step by step drawings. BTW, the next few projects are Ana White designs… she is THAT good! This modern farm DIY bench by ‘Ana White‘ has a more sleek and minimal design, that would be perfect for a more contemporary home, but would still fit nicely in any casual style. Love this! This easy upholstered entry bench by ‘Ana White‘ is the only one we have in this line up. (Upholstered, that is.) Full tutorial. These last three are simply inspirational… we wanted to include them because we figure, by this point in the post, your creative mind is pumping out your own ideas, and these should help! 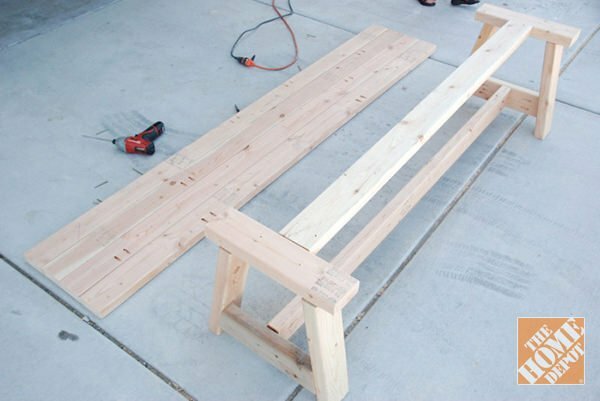 Enjoy creating your own DIY entryway benches, and let us know in comments how your projects went! 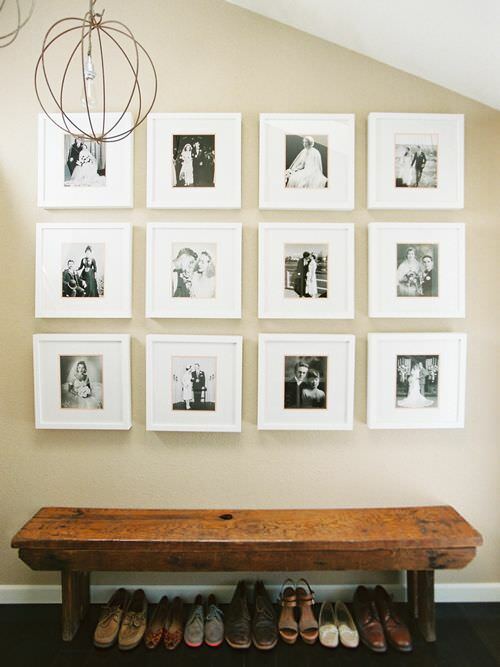 From Erich McVey on ‘Design Sponge‘, we love this rustic wood entry bench. 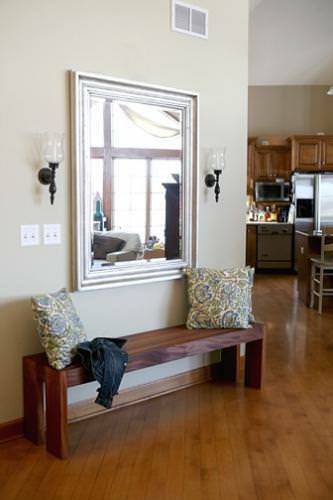 From’Arkin Tilt Architects‘ on ‘Houzz’, this bench was made from a walnut tree that fell during their project. 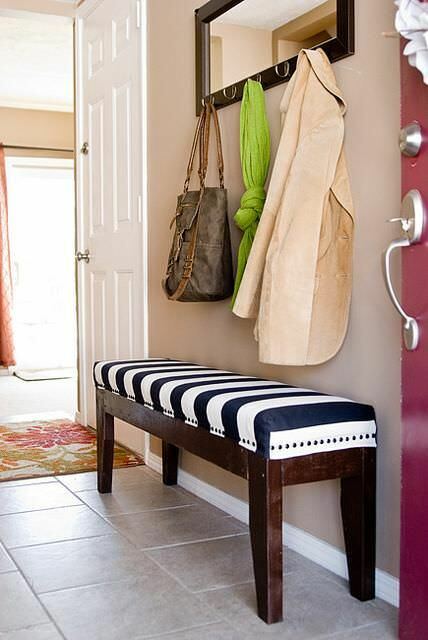 Lastly, this entryway bench on ‘Homedit’ is a simple idea… a board attached to two wooden stools! That should get you thinking! 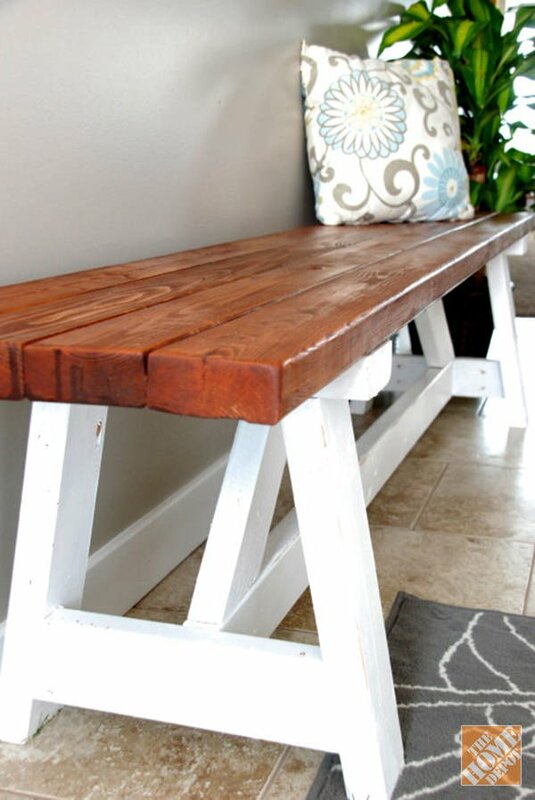 We hope you loved our post on 15 Easy DIY Entryway Bench Projects! 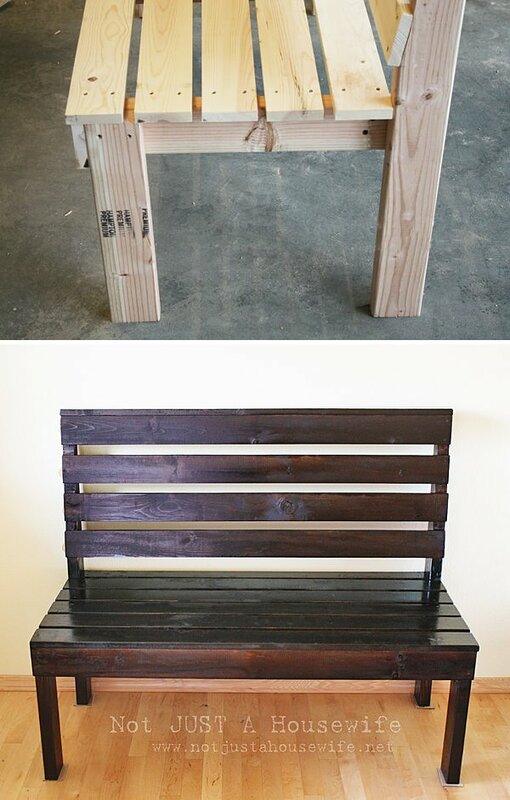 We think you will also want to pop right on over to 12 DIY Storage Benches and DIY Bunk Beds! Thank you for all of the options!